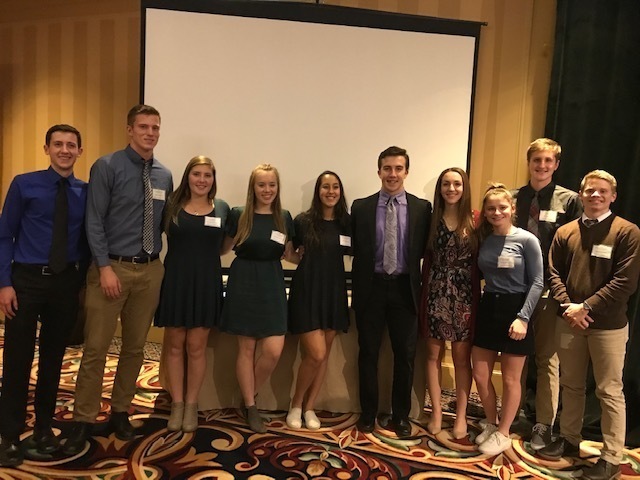 Elena Clark and Colby Brouillette of BFA Class of 2019 were two of the top ten Scholar Athletes for 2018 recognized by The Vermont State Athletic Directors Association at the LEadership Conference for their accomplishments. Elena Clark is a three-sport athlete at BFA St. Albans, and by graduation will have earned twelve Varsity letters in soccer, basketball and lacrosse. She has also served as a multi-year captain in each of her sports. Elena has earned High Honors for every semester of high school, was awarded the Math Club Award, and has received the Bronze and Silver Pin, having earned 39 semester "A's" leading up to her senior year. In the area of leadership, Elena is a member of A World of Difference, the Athletic Council, the National Honor Society, and was the captain of her Powderpuff football team for the annual BFA-MVU fundraiser. Elena gives back to her community through her volunteer work at Comet Basketball Camp, Christmas caroling at local retirement homes, mentoring at a local middle school, taking part in Operation Happiness, serving breakfast for Police Officers, and waiting tables at the Parish Appreciation Dinner. In the words of BFA St. Albans Athletic Director Dan Marlow, "Elena Clark brings a smile to the face of everyone who knows her. She has a friendly and genuine personality and is always respectful, hard-working and caring in all her interactions with teachers, coaches and peers. Her character is beyond question based on strong family and personal values. She has been a three-sport athlete and is the consummate team player." Colby Brouillette is a multi-year letter-winner in soccer, hockey, baseball and football at BFA St. Albans. In hockey, he was named to the 2018 VT State Second Team and was a 2017 Honorable Mention. In baseball, he was named the 2018 Metro Co-Player of the Year, and made the 2018 USA Today Vermont Second Team. Colby ranks in the top 5% of his graduating class, having made the High Honor Roll from 9th grade to the present, and is a member of both the National Honor Society and the National Technical Honor Society (Medical Professions). In the area of leadership, Colby is the Student Council President, a member of both the BFA Athletic Council and A World of Difference, attended the Anti-Defamation League Leadership Conference in Boston, MA, and was selected to Green Mountain Boys State. Colby gives back to his community through participation in Operation Happiness, serving as a volunteer youth hockey and baseball coach, volunteering at the Helping Hands Thrift Shop, and coaching in the annual Powder Puff Football fundraiser for cancer research. BFA St. Albans Athletic Director Dan Marlow states, "Colby has resigned himself to lead by his example and values and is comfortable to take charge whenever called upon. He is one of the most respected and appreciated student-athletes in school and exemplifies all that is good with young people and their programs today!" Please take a moment to congratulate Colby and Elena!